If you really lived in a home designed like the Kaleidoscope House, would it be uncomfortable to use the toilet or take a bath/shower with all that glazing? We have a wall of glass in the rear of our house and sometimes I wonder if my neighbors can see me making a sandwich, muttering to myself (Everybody does it! ), or snacking while sitting on the island to see TV in the family room (barbaric!). It makes me a little self-conscious when I remember that the curtains are open and the show is free. I don't think I could have floor to ceiling glazing that exposed the outside world to my bathroom unless it was the kind of glass that clouds over with electric current, but what do you do when the power goes out like it does so often here in California? In this You Tube era, I'd hate to be the most watched, emailed and laughed at video of "somebody in the bathroom". 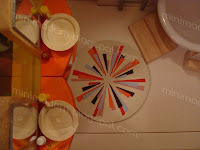 Anyway, the images above are a bathroom design in the Kaleidoscope House. The tub is a small bowl that I got from Marshalls a couple of years ago. 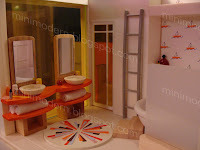 The sinks are from Voila Toys and the toilet (not so obvious in the small room behind the sliding door) is Theo Klein. For those who routinely inquire: This room took about 10 minutes--mostly because I kept dropping the bath products. Putting together miniature scenes is sometimes like trying to rob a tiny house with hundreds of laser sensors. I don't use tweezers because they drive me crazy but on the odd occasion when I keep dropping items or bumping furniture with my hands trying to set tiny pieces down, I wonder if I should try the tweezers again...Nah! I like the steps to the tub! I kow it's kind of a dumb question because if I had one, I wouldn't want to part with it, but do you think you'd ever sell your Kaleidoscope House? I'm trying to find one, but I can't find any under $600. No, I'll probably be passing this one down to my grandkids. I'm attached to it. That's ok. I understand, I would be too. I just hope to get one someday.